Here’s a quick review of what’s important to know about the wide assortment of scopes and scope features available today. Other than the multimeter, by far the most useful test equipment in an electronics lab or maintenance shop is the oscilloscope. In recent years, this instrument has evolved in unexpected directions so as to incorporate functionality way beyond the original CRT machines of an earlier age. As test equipment goes, the oscilloscope is one of the most costly, so it is worthwhile putting some thought into purchasing a new instrument. The good news is that the better models are versatile and built to last. That is the rationale for making a substantial capital investment now rather than later, so the benefits can accrue right away. The oscilloscope in your lab will far outlast a new car in the parking lot, so why not spend a comparable amount? There are plenty of low-end oscilloscopes that can be had at little cost, but they aren’t much use to the serious student, researcher, product developer or repair technician. In contrast, an advanced mixed-signal instrument that can display analog activity in a power supply and simultaneously, in the same display, show digital circuit behavior downstream, will let the user quickly find bugs in product prototypes or diagnose ailments in existing equipment. The three big manufacturers are Tektronix, Teledyne LeCroy (formerly LeCroy) and Keysight (formerly Agilent and before that Hewlett-Packard). These firms have venerable histories. Each made substantial contributions, setting the stage for today’s amazing oscilloscopes. Tektronix founders Howard Vollum and Jack Murdock, returning from military service at the end of World War II, built upon British radar technology to create the first commercially viable triggered-sweep oscilloscope. A stable display of a repeating waveform is created by initiating the trace at a single specified location, the trigger point, in each cycle or group of cycles. This innovation changed the oscilloscope from a lab-only instrument to the versatile measuring tool that it has become. Teledyne LeCroy also played a key role in the development of the oscilloscope as we know it today. Walter LeCroy, founder, had worked at CERN’s (European Organization for Nuclear Research) giant high-energy particle collider that straddles the border between Switzerland and France, and he had acquired an insider’s knowledge of digital electronics as it relates to instrumentation. Returning to the New York facility, he, along with several associates, made the decision to apply high-energy physics technology to a new product line, the digital storage oscilloscope. The old CRT machine was gone. Characterized by flat screen and new digital architecture, this instrument, together with the Tektronix digital-sweep design, made possible a totally new truly portable oscilloscope that, aside from a few all-analog machines, has come to dominate the market. Agilent (now Keysight) has been another powerful presence in this arena. It was originally part of Hewlett-Packard, which invented the mixed-signal oscilloscope (MSO) in 1996. This instrument permits the user to see analog and digital signals in a single display, greatly facilitating debugging. At present, all major manufacturers offer this capability, and it is considered essential in the world of research and development. In 1997, Hewlett-Packard offered the first Windows-based oscilloscope, moving the tool from exclusively signal viewing to signal analysis. In 2002, the company (then called Agilent) introduced an advanced probe technology so bandwidth was no longer lost when probing a soldering pad. In 2005, Agilent broke the 10-GHz, real-time oscilloscope bandwidth barrier. In 2011, Agilent introduced the built-in function generator. In its current incarnation, Keysight maintains a highly aggressive research and development effort and will certainly challenge its competitors on all fronts, while Tektronix and Teledyne Lecroy can be expected to initiate still more innovations. Modern scopes often incorporate several additional test instruments. This Agilent (now Keysight) model, for example, can integrate a logic analyzer, serial protocol analyzer, dual-channel arbitrary function generator, and digital voltmeter. It must be emphasized that as the big three oscilloscope manufacturers came out with innovations, their competitors immediately adopted them. In some instances this happened following court settlements, like the one between Tektronix and LeCroy following epic legal battles. Other advances, such as incremental bandwidth increases, are not clearly patentable. In any event, the user has gained, for these instruments are robust, high-spec, user friendly with lots of available documentation and wonderful free tech support. The big three oscilloscope manufacturers offer products at a wide range of prices. Some are enormously expensive. The Teledyne LeCroy 100-GHz Labmaster 10 ZiA oscilloscope starts at $900,000. The greatest single factor in the equation is bandwidth. The entire instrument from probes and analog inputs through CPU and all phases of signal processing must be engineered to allow for a high bandwidth, and this involves a heavy investment in research and development, as well as intricate hardware construction. In choosing an oscilloscope, it is a wise move to decide on the maximum anticipated bandwidth requirement and order accordingly. Many manufacturers, notably Tektronix, offer bandwidth-upgradeability, so it is feasible to purchase what you need right away and add bandwidth later. A similar situation applies to options including available modules and built-in instrumentation. Modern scopes typically use a variety of techniques to highlight rare events. This Tektronix MDO3104, for example, uses intensity grading to indicate how often rare transients arise relative to normal signals. And a temperature palette uses color grading to indicate frequency occurrence … hot colors denote frequent events, cold colors denote rare ones. Aside from the big three, there are numerous lower-end competitors. Without the heavy research and development payload, they are able to offer products varying from good to primitive at substantially lower prices. If your choice is primarily cost-driven, by all means read online documentation and request a demo unit. Rigol is a special case worth looking at. It offers a four-channel, 100-MHz mixed signal oscilloscope for just over $1,000, in addition to numerous used, refurbished and demo models at prices that anyone can afford. Don’t expect big-three features or quality you might get for upward of $10,000, but this is an option worth considering for those who’ve got to start somewhere. Quite a number of manufacturers offer PC-based scopes. These are devices, complete with probes, that connect by USB cable to a user-supplied desktop or laptop computer to provide the display. Proprietary software is supplied by the PC-based oscilloscope manufacturer, to be installed by the user in the PC. For this application, it is best to have a dedicated computer on your bench. The PC-based oscilloscope is small—some models will fit in your shirt pocket. Many models have surprisingly high specifications and advanced features. These PC-based oscilloscopes are totally affordable, and it is worthwhile to obtain one of them solely for the perspective it provides. If you don’t count the user-supplied computer, the cost is minimal, but some of the advanced features are options that must be purchased separately. • Valuable bench space is always at a premium, and the desktop computer is bulky as instrumentation goes. A laptop always seems to be in the way when undertaking anything beyond a simple task. • The PC power supply is a strong source of electromagnetic noise that will overwhelm low-level signals. Careful shielding is needed. • Bandwidth as specified may be unrealistic due to the role played by cabling, probes and the PC itself. • Sampling rate and resolution may be negatively impacted by the cable type and terminations between oscilloscope and PC. Data transfer rate may be expected to decline. • If an older PC is used, proprietary software may not be compatible with the operating system. Mac owners should proceed with caution. • Full-scale, bench-type oscilloscopes can expect far longer life expectancy compared to the PC-based combination. Yokogawa offers some advanced oscilloscope products that are noteworthy for their wide range of specifications and high-tech features including 8- and 16-channel (plus logic) models and abundant accessories, such as six current probes handling up to 500-A RMS at bandwidths up to 100 MHz. Nine differential probes are offered. Yokogawa oscilloscopes have great features—math, labels, automated measurements, zooming and so on. The mixed signal DLM4000 is an 8-channel instrument suitable for test and debugging applications in embedded systems, power electronics, electromechanical and automotive systems. The eighth input channel converts to an 8-bit logic analyzer when a button is pressed. Many available options can be purchased, and the machine has the palpable advantage of displaying signals on a 12.1-in. LCD. Included on the Yokogawa website are links to many application notes and white papers. There are also videos and on-demand webinars. Among the videos are detailed comparisons to Tektronix and Agilent products. This highlights the fact that all of the major oscilloscope manufacturers are intensely competitive with no letup in sight. Tektronix, Keysight and Teledyne LeCroy all manufacture high-quality, hand-held oscilloscopes. While they don’t have the specifications and operator interface of a bench-type instrument, they are capable of serious work and the cost is considerably less. Additionally, there are compelling advantages. One is portability. Where it is necessary to move around in a harsh indoor or outdoor industrial environment where ac power may not always be available, the hand-held oscilloscope in a rugged case is the right tool. As a second instrument, the hand-held oscilloscope is quite appropriate. Hand-held portable scopes, such as the Tektronix THS 2024, excel at safely making floating or differential measurements. A typical job for this Tektronix scope is in making three-phase power measurements. The hand-held oscilloscope has one other important advantage. By way of background, the bench-type oscilloscope, connected to the premises ac wiring, is solidly grounded. However, if because of wrongly terminated or crossed wiring in the entrance panel, any junction box, wall receptacle or extension cord along the way, grounded and hot wires may be reversed. If this condition arises in the supply to the equipment under test, connecting the ground lead of a bench-top scope probe to a chassis ground may bring sparks and smoke, possibly damaging the oscilloscope. A similar hazard exists when attempting to make point-to-point measurements where both sides are energized at some voltage that floats above ground potential. This condition exists within variable-frequency motor drives at both ends of the dc bus. The problem can be avoided by using a high-voltage differential probe, but a more economical way to go is the hand-held instrument. It is battery operated, independent of the premises wiring, and the ground returns for all channels are isolated from one another, so point-to-point measurements on voltages that float above ground potential are not hazardous in terms of an unintended ground fault through the oscilloscope. 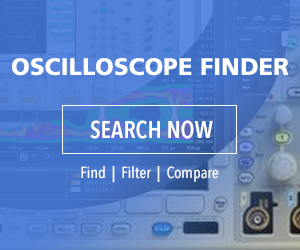 Oscilloscope prices range very widely. Some of the small manufacturers, unencumbered by research and development programs, offer low bandwidth products for less than what you would pay for a new TV. Speaking of which, there are instructions available on the Internet for converting an old black and white portable TV to an analog oscilloscope for the price of a few grommets and some hookup wire. What is involved is connecting the feed from a probe to the vertical input circuitry so that the amplitude displays. Shift the vertical deflection signal to the horizontal circuitry to provide a time base. Use a felt-tip pen to draw X- and Y-axes on the face of the CRT. Expect minimal features and performance, not to mention bandwidth. This contraption is of value only as an educational project. Don’t attempt the conversion unless you understand about residual voltage which can be lethal long after the TV is disconnected from the power source, especially when working around deflection circuits. Some scopes can go well beyond the traditional two or four channels. Teledyne LeCroy LabMaster models, for example, have a modular design that permits measuring up to 80 channels through add-on modules. Another low-end way to go is eBay. The problem here is uncertain quality and difficulty getting parts or recalibration if needed. For the most part, the big manufacturers sell through authorized dealers, who are well-trained and able to provide good service. Prominent among them is Test Equipment Depot. They carry equipment by all major oscilloscope manufacturers in addition to multimeters, arbitrary function generators and everything in between. They offer used and refurbished oscilloscopes and accept trade-ins. Corporate purchase orders are accepted pending credit approval. Leasing is available for customers who want to preserve working capital. The companay also offers repair services, specializing in Tektronix and Hewlett Packard. Technicians are factory trained. This overview of the oscilloscope marketplace is intended to provide perspective for individuals contemplating such a purchase. These amazing instruments are costly, but offer insights into the operation of electronic circuits that cannot be gained in any other way, and for this reason the investment is justified. David, this is a very well done side-by-side comparison of what should go into the selection process of choosing an Oscilloscope. May I also suggest that the end-user should consider “Standard Warranty”, availability on the “Rental Market for short term requirements”, and “Product Support” from the OEM. I want to buy an oscilloscope to test and repair fanuc servo amplifier , wthat is the best , any idea, cost?